1. A new sample video from the Vuze camera that shows impressive video and audio quality. They uploaded the video sample only to Facebook, so I couldn’t post the video here. See here to check it out. 2. 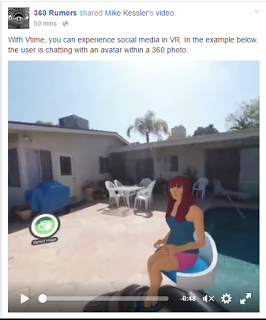 A demonstration of a VR social media app, Vtime, which allows you to chat with virtual avatars in your 360-degree photo. 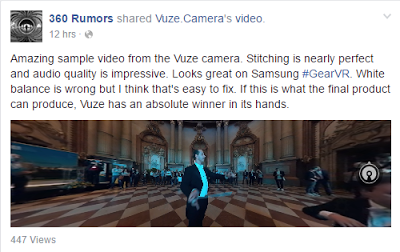 (The video is on Facebook, so as with the Vuze sample, I couldn’t post it here either.) See here to check it out. 3. 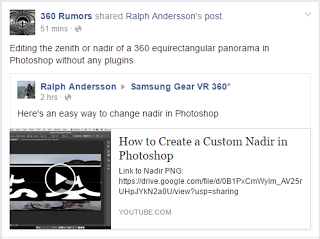 How to edit the zenith or nadir of a 360 image (equirectangular format) in Photoshop without using a plugin. See here to check it out.